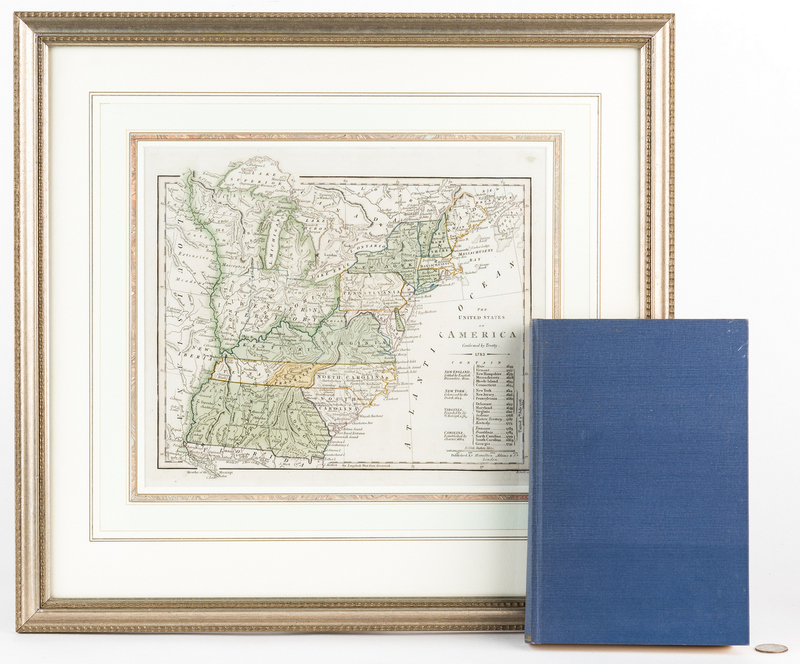 Two (2) State of Franklin, Tennessee related items, including 1827 Benjamin Smith map and Samuel Cole Williams book. 1st item: Map titled "The United States of America Confirmed by Treaty 1783", engraved by Benjamin Smith, published by Hamilton, Adams, and Company, London, 1827. 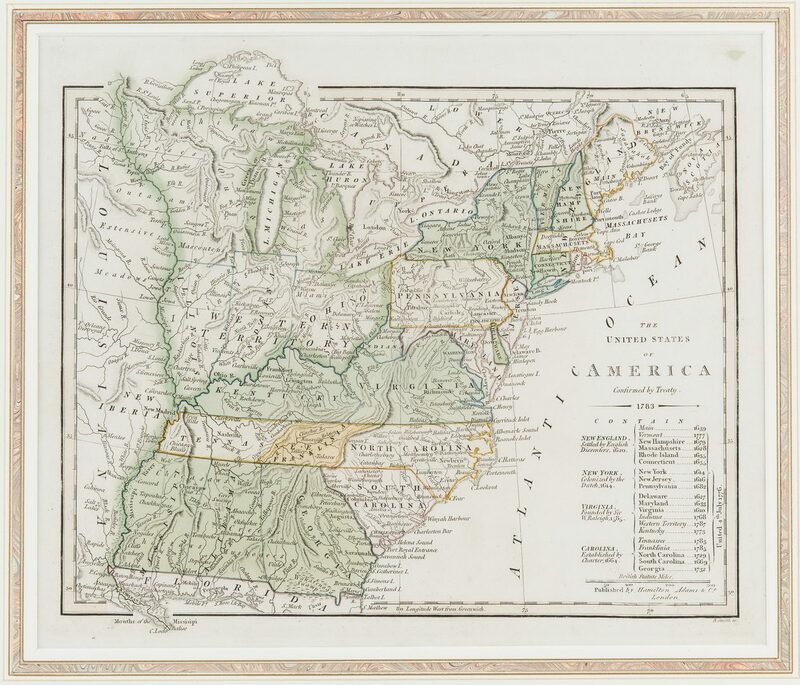 Copper plate engraving with hand coloring depicting the boundaries of United States of America and territories after the signing of the Treaty of Paris, with states including the State of Franklin, the Western territory, Louisiana territory, New Iberia, towns, roads, county lines, bodies of water, rivers including the Mississippi River, mountains, the locations of Native American tribes, and anomalies including the misplacement of Indiana. 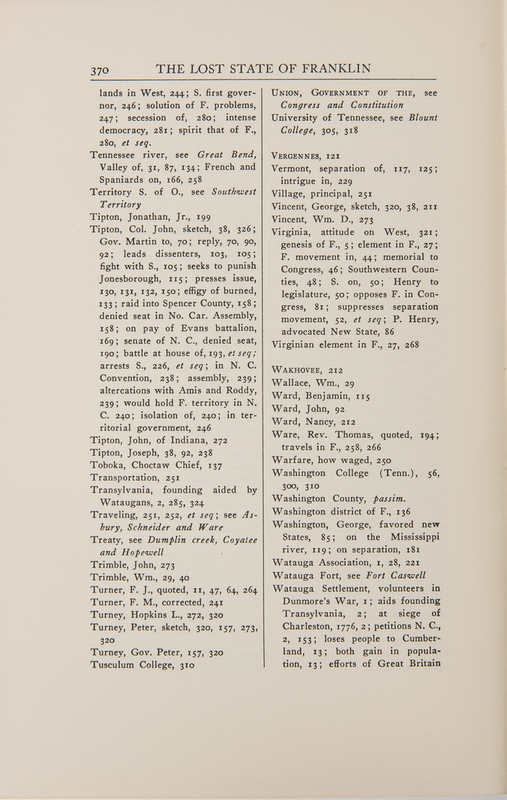 Title and table with information about the foundation of the earliest colonies, lower right. 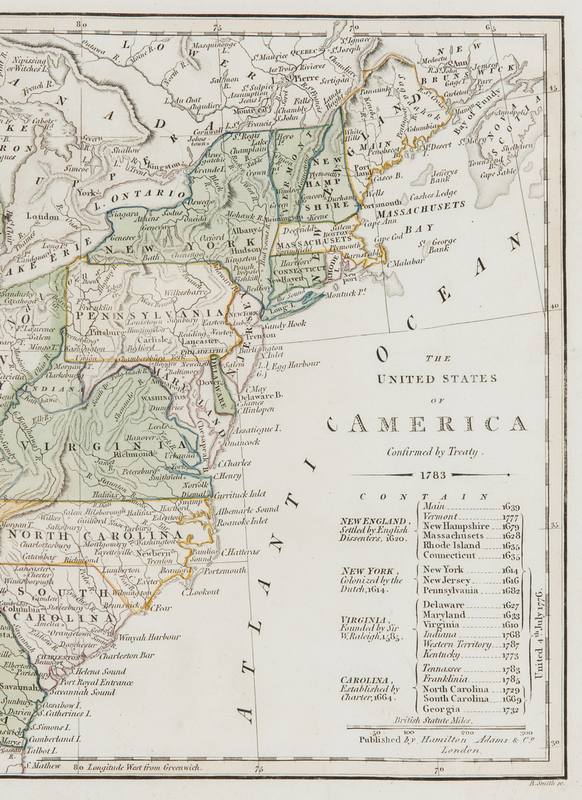 "Longitude West from Greenwich" centered below map. 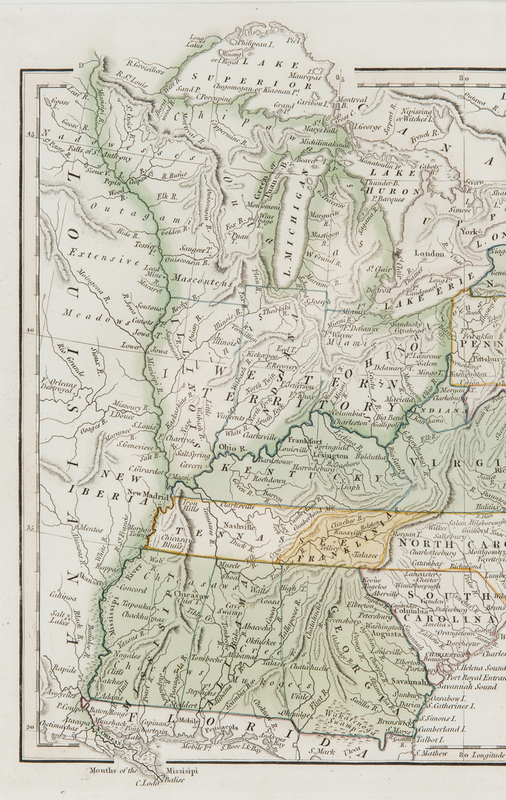 Surrounded by scale notations and a double line border. 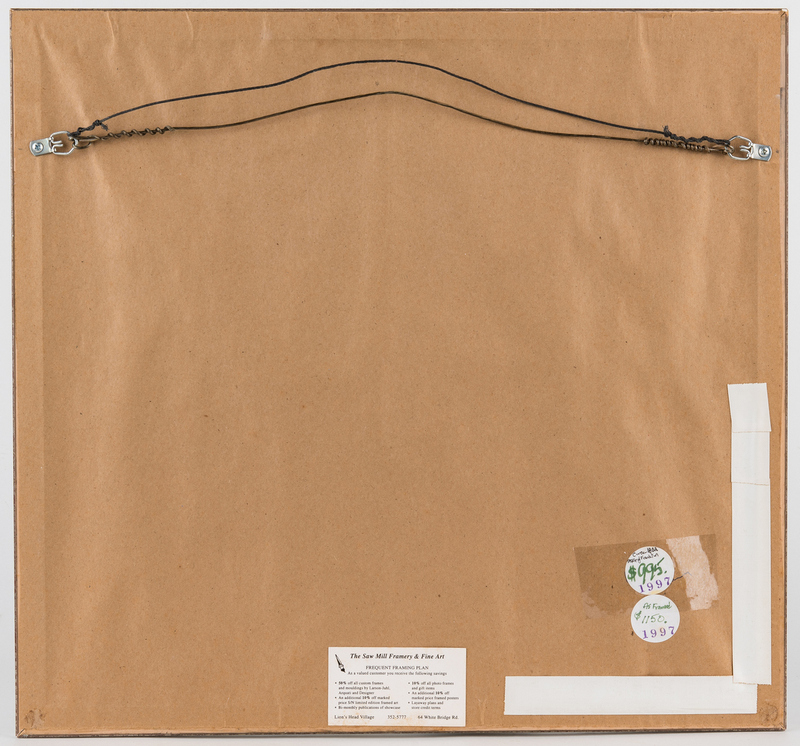 Encapsulated (not laminated) under glass in a plastic archival sleeve and matted in a gilt wood frame. 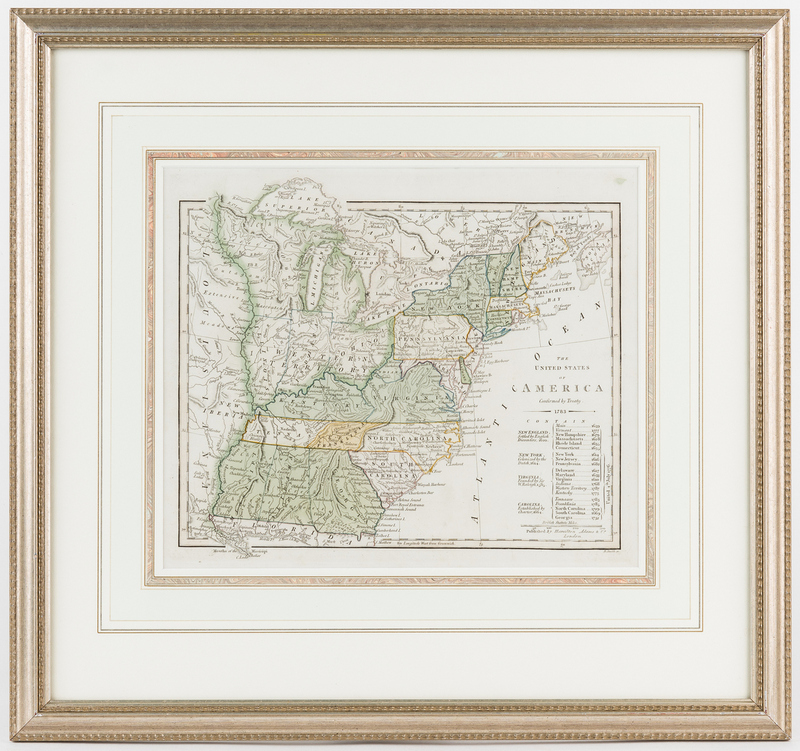 Image – 9 3/4" H x 11 1/4" W. Sight – 10 1/4" H x 12 1/4" W. Framed – 18 1/2" H x 19 3/4" W. Early 19th century. 2nd item: Book titled, "History of the Lost State of Franklin" by Samuel Cole Williams, 1970. 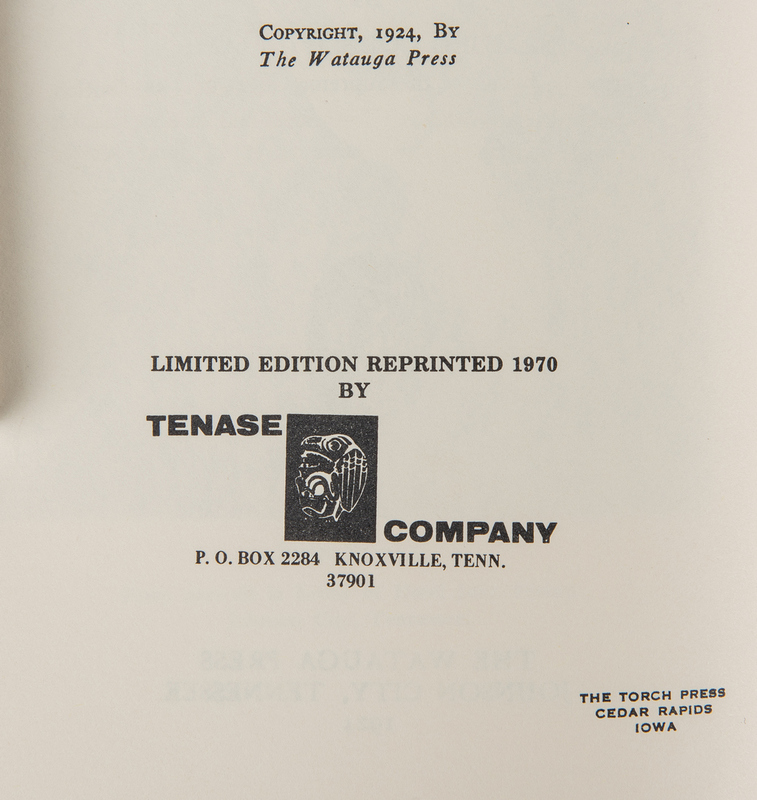 Originally published by The Watauga Press, Johnson City, limited edition reprinted by Tenase Company, Knoxville. 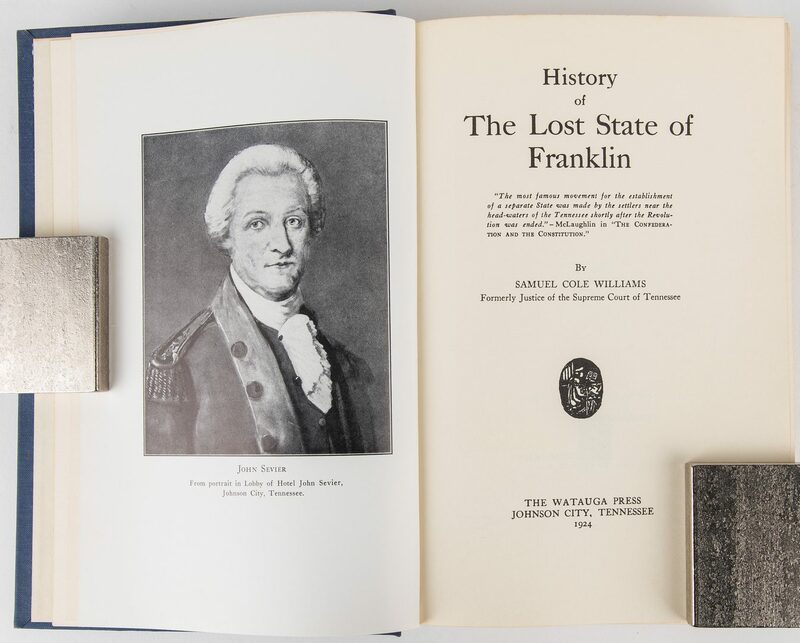 Octavo, 371 pages with lithograph frontispiece portrait of John Sevier, hardbound in blue cloth with gilt lettering to spine. 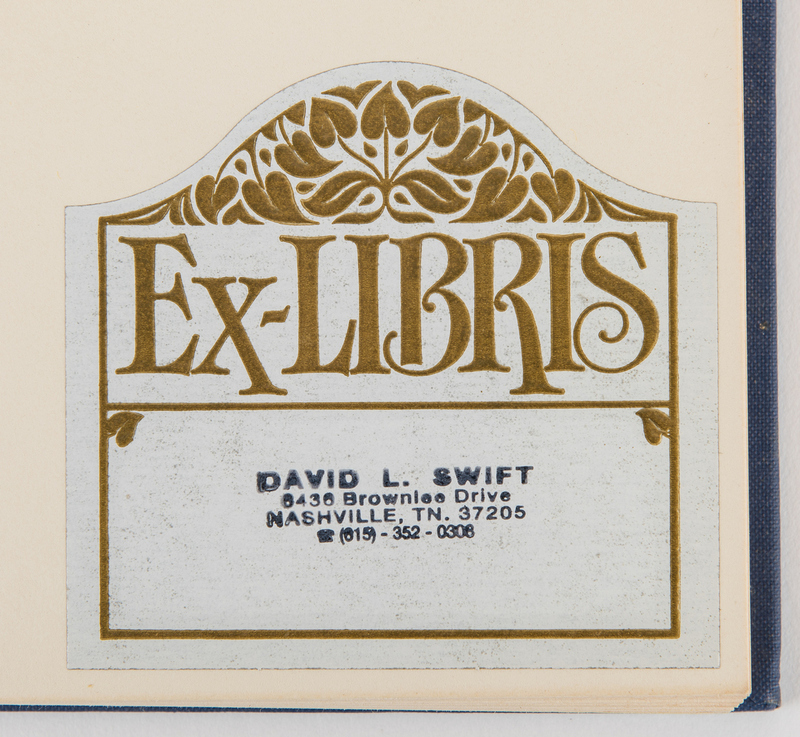 Ex libris book plate, front end paper. 9 1/2" H x 6 5/8" W x 1 5/8" D. Early 20th century. 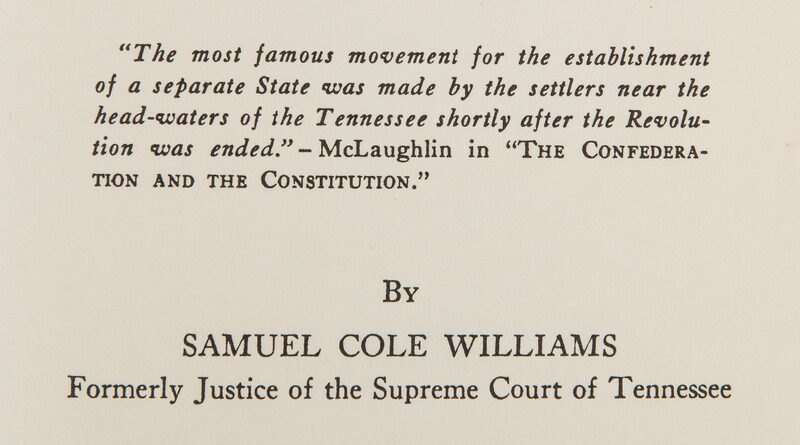 Note: The State of Franklin was an unrecognized and autonomous territory located in what is today upper Eastern Tennessee. It was founded in 1784 with the intent of becoming the 14th state and its leaders included Arthur Campbell and John Sevier, who was elected Governor. 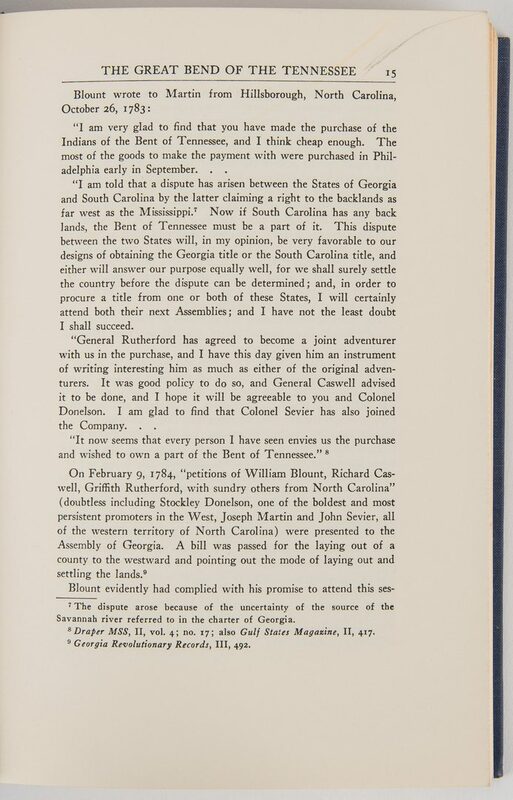 Franklin's first capital was Jonesborough, later Greeneville. 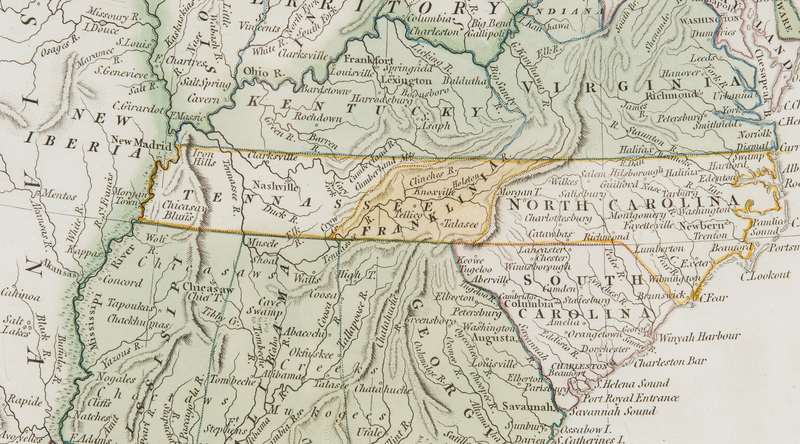 It was never admitted into the union, and existed for only about four and a half years, after which North Carolina re-assumed full control of the area. 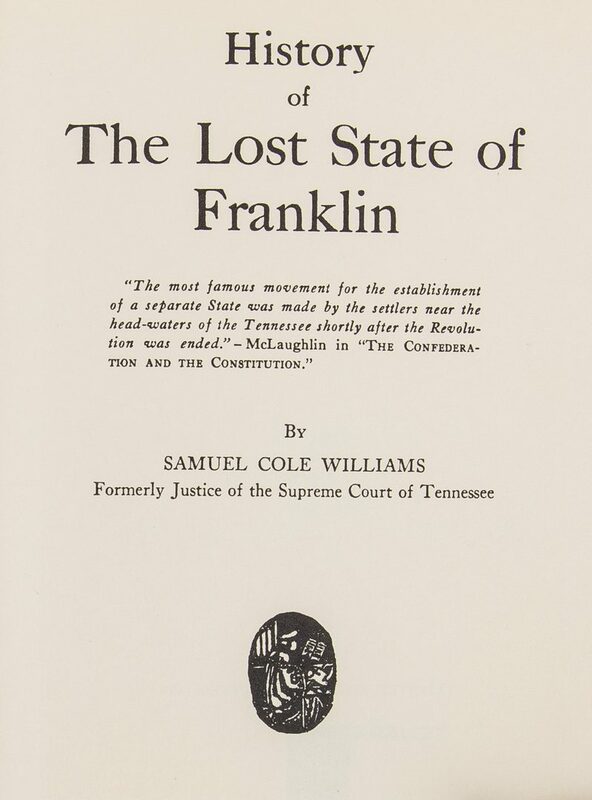 For further reading, see https://tennesseeencyclopedia.net/entries/state-of-franklin/ . CONDITION: 1st item: Overall very good condition. Not examined outside of frame. 2nd item: Overall good condition with few scuffs to covers, corners slightly bumped. Pages in overall good condition with light toning, few pencil inscriptions.